Tag line: "Discover the Heart of the World"
Distributed by National Geographic, Jerusalem takes us inside this ancient city, a place that, as narrator Benedict Cumberbatch puts it, is “The gateway to God for 3 major religions, and one of the most fought-over pieces of land in history, where Jews, Christians, and Muslims live side-by-side, but in separate quarters, each in their own Jerusalem”. Jerusalem follows three young women: Muslim Farah Ammouri; Israeli Revital Zacharia; and Christian Nadia Tadros, as they take us on a guided tour of the Jerusalem they themselves are familiar with, each focusing on their own specific section of town. In addition, Jerusalem introduces us to Dr. Jodi Magness, an archaeologist whose team is piecing together the history (from the Roman era and earlier) of this most cherished land. Conquered over 40 times by invading armies, Jerusalem is, even today, a city divided along religious lines (“Although we live in the same area,” one of the three girls says, “we don’t know a lot about each other”). Yet what I liked most about this 2013 IMAX documentary is that it didn’t spend time exploring the conflicts that separate the city’s residents, but instead centered on the similarities of each group, including the shared belief that Jerusalem is the cornerstone of their faith. Over the course of the movie, we visit such important locales as the Western Wall (the site of an ancient temple erected by Herod the Great and a place where Jews come to offer their prayers to God), The Dome of the Rock (which houses the Foundation Stone, a sacred artifact that Muslims believe marks the spot where the prophet Mohammed ascended into heaven), and The Church of the Holy Sepulchre (perhaps the holiest cathedral in the Christian faith, which, according to legend, was built where Jesus was crucified and buried). In addition, we witness various religions ceremonies, including a Bar Mitzvah, prayer during Ramadan, and the Easter Sunday ritual in which Christian pilgrims re-enact Jesus’ long walk to the crucifixion. 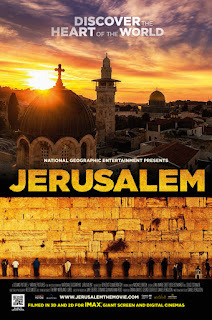 Though its citizens remain at odds with one another, Jerusalem shows us, in sometimes beautiful detail (as with many IMAX films, the cinematography is gorgeous), just how much they have in common.